The events took place in Dunbar, WV. I live in a 1930s home on a hill with the wooded area beyond the property, across the street a cemetery. I’ve seen deer pass by a lot and a coyote or two but nothing like this. I encountered my worst fear tonight while taking my dog out. I happen to look up from the porch to see this animal slowly stalking Yukki, it had black mattered fur and was very shaggy, and one glowing eye (the other was covered with fur), pointed ears, and a snout of a wolf. It gave off a very heavy ominous feeling. It was huge at least three times bigger than my petite German shepherd Akita mix. I yell for Yukki to come, she chases it across the street to the graveyard, the creature never made one sound. I screech for her to come back so loud that I’m pretty sure my neighbors think that I’m nuts now. I ran in to get my phone. When I came back outside a few seconds later Yukki was sniffing the grass in my yard like nothing happened. 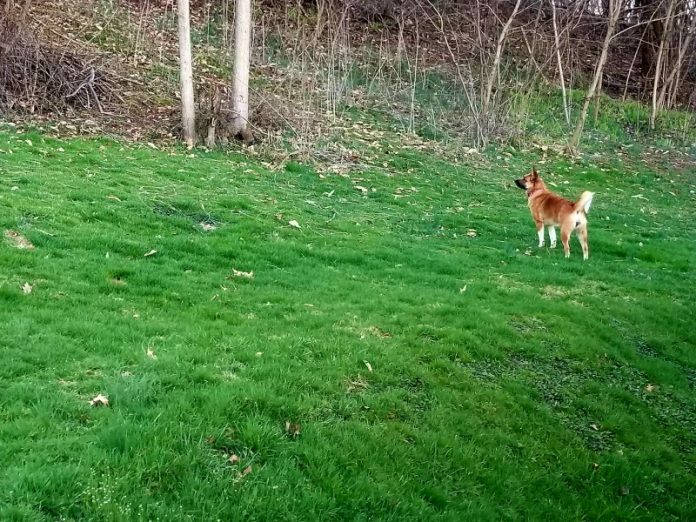 My dog did not seem frightened or extremely protective like she does when encountering a new dog, she acted like she wanted to play. Now I am really getting freaked out! I just took my dog out at dusk she peeped but was cautious of pooping towards the back of the yard. She had an odd stance to her and was towards the front of the yard where the first incident happened, it seemed as if the woods had black fog coming from them. I put it out of my mind and said it’s getting dark. She bolted to the woods as I scream for her to come back I don’t hear a fight just a lot of breakage of branches way more than when she chases deer, like something huge, was up there. This went on for a few seconds then I just hear Yukkis footsteps close by, I yell for her. Coming from around the back of the house is a beautiful white spotted brown animal, it went to enter the woods. It was the size of a coyote but had a bobbed tail and white gleaming fur with soft brown spots. It looked like a Lynx but was the size of an adult female deer. I didn’t feel dread or fear or an overwhelming darkness like the first time. I forgot about everything for a second and just looked at this beautiful animal as it stared at me for a few seconds then left. Yukki came back about a minute later completely fine, panting. Yukki has not gone number two for two days now. She is weary to go near the back of the yard near the woods where it happened. The format of the story is from a sister site where I stated the first event then the second one happened so I reported it as soon I could it was not a West Virginia site and wanted to share my story on here as well. The picture was taken in the fall in the yard where the second event happened. Would you like to make a donation to help support West Virginia Ghosts? Your donation will help us pay for our server costs and for continued research. How often would you like to donate to West Virginia Ghosts? You can donate monthly, yearly, or just make a one-time contribution. We would like to thank you in advance for your donation. West Virginia Ghosts runs on very limited financial support and your donation will help us tremendously, no matter the amount. Stories are personal encounters that were submitted to us by our website visitors. Unless otherwise mentioned, stock photos are used to help represent the story and are not actual photographs that were taken during the author's encounter. © 1999-2019 West Virginia Ghosts.